Hydraulic Fluids target environmentally sensitive areas. Designed to help prevent contamination and fines in regulated or environmentally sensitive hydraulic applications, Clarion Green Synthetic Fluids are fully synthetic and are available in ISO 22, 32, 46, and 68 viscosity grades, while Clarion Green BIO Fluids are formulated with high oleic natural esters and are available in ISO 32, 46, and 68 viscosity grades. Both anti-wear products are biodegradable, non-toxic in acute aquatic toxicity test, ashless, and zinc-free. HOUSTON, -- Clarion® Lubricants is expanding its product offerings with two new products: Clarion Green Synthetic Fluids and Clarion Green Bio premium anti-wear hydraulic fluids. Both are designed to help prevent downtime, contamination and fines in regulated or environmentally sensitive hydraulic applications without sacrificing equipment performance or efficiency. "As we develop new products within the Clarion line, we dedicate our science and expertise to making them the safest lubricants we can," said Ben Briseño, industrial product line manager for Clarion, part of the CITGO Lubricants brand portfolio. "When you use Clarion Green Synthetic and Clarion Green Bio Lubricants, you can be confident you are getting product performance and equipment protection without sacrificing the safety of your business." These premium products are readily biodegradable, non-toxic in acute aquatic toxicity test (LC-50), ash-less and zinc free - while providing performance. Additionally, they satisfy Coast Guard Vessel General Permit (December 2013) requirements for Environmentally Acceptable Lubricants (EAL). Clarion Green Synthetic Fluids are fully synthetic and are available in ISO 22, 32, 46 and 68 viscosity grades. 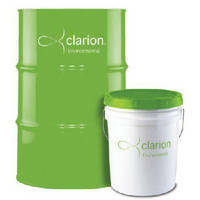 Clarion Green BIO is formulated with high oleic natural esters, and is available in ISO 32, 46 and 68 viscosity grades. Clarion Green Synthetic and Clarion Green BIO products offer premium anti-wear protection, rust and corrosion protection and oxidation stability. Clarion Green Synthetic Fluids offer excellent thermal stability and low temperature properties. Use Clarion Green Synthetic Fluids and Clarion Green BIO in accordance with equipment manufacturer recommendations. Fluid monitoring through LubeAlert® CPM Analysis is recommended to maximize fluid service life. Moisture content should be maintained at less than 500 ppm. Improper system conversion and mixing with other lubricants may affect performance. For more than 40 years, Clarion Lubricants, part of the CITGO Lubricants brand portfolio, has delivered the industry's broadest line of safe, protective lubricants, including food, environmental and synthetic grade formulations that contribute to a more sustainable future. The complete line of lubricants is available through regional distributors and online at www.clarionlubricants.com. For more information, visit the company's website or call 1-855-MY-CLARION.